The H series comes with fully automatic plate loading and paper removal features for up to 50 x 0.3mm plates or 100 x 0.15mm plates. All H-Series units are compatible with CRON multi-directional bridges. The exposing engine, based on CRON’s market-leading magnetic linear drive platform, provides fault-free imaging across a wide choice of resolutions and a tonal range of 1-99%, in either conventional or stochastic screening. Consistent drum vacuum pressure control, and optional integrated online punching for up to 3 punch configurations, enables precise registration to an accuracy of 0.01mm for a wide range of formats. Due to the high level of integration, H-series units are an amazing one-third of the size of similar products. 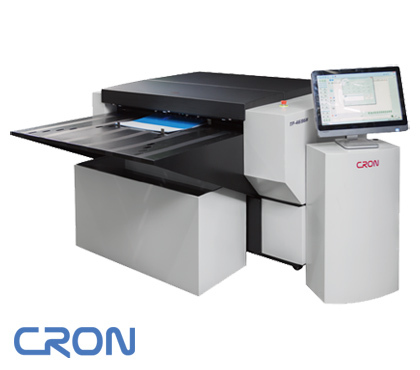 The H series CTP has been developed to provide print operators with exceptionally high quality imaging whilst also saving money on print production and running costs.